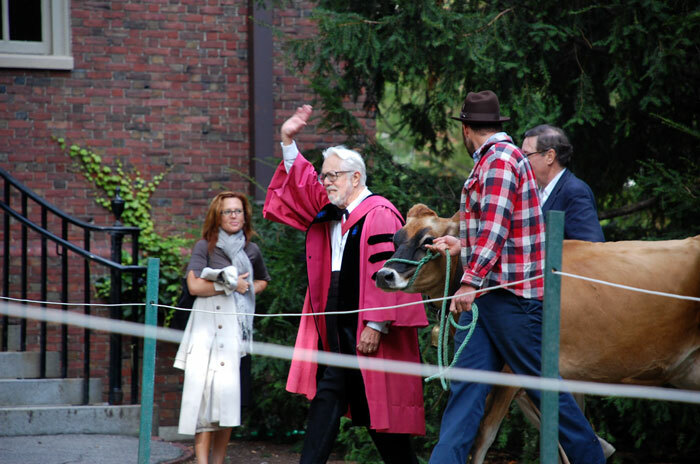 Harvey Cox, Harvard’s ninth Hollis professor of divinity, introduces Faith, his guest of honor, and Ben Holmes, both from The Farm School, in Athol, Massachusetts. 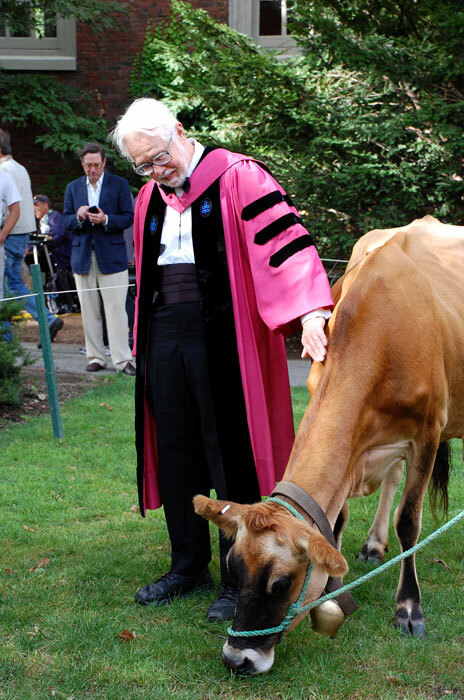 Cox asserts his endowed chair’s prerogative as Faith grazes in Tercentenary Theatre, once part of the College cow yard. Cox leads the way as the festivities shift from the Yard to the Divinity School. For more images, visit the Harvard Divinity School website. 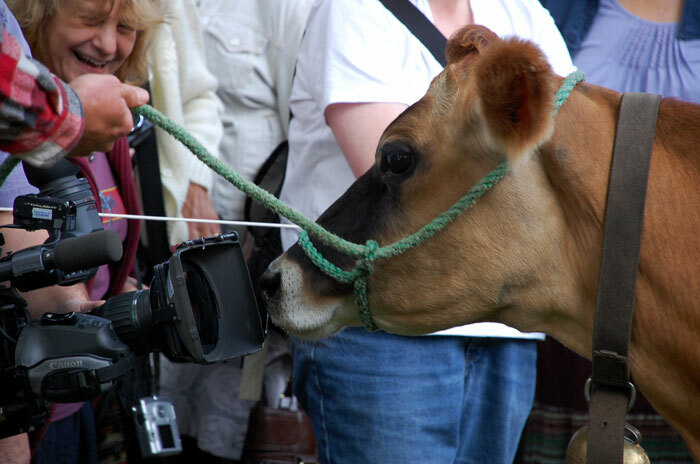 A clinking cowbell. Veggie comestibles. 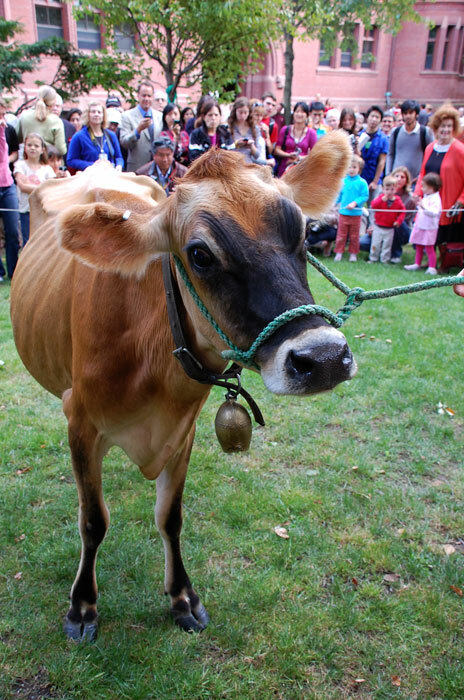 Mo[oooo]vere ad Deum et ruminare and the Udderly Tuba Ensemble jazzing up “Old MacDonald.” Happily blending the University’s twenty-first-century ecological slogan—“Green is the new Crimson”—with centuries-old Harvard tradition, a Jersey cow graced and grazed in the Yard on September 9, admired by throngs of spectators. 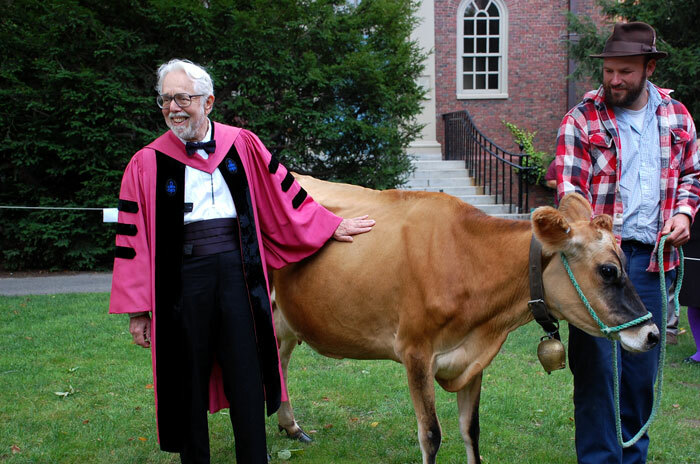 “Faith,” ordinarily resident at The Farm School, in Athol, Massachusetts, “is the real celebrity today,” declared Hollis professor of divinity Harvey Cox, who engineered her appearance. 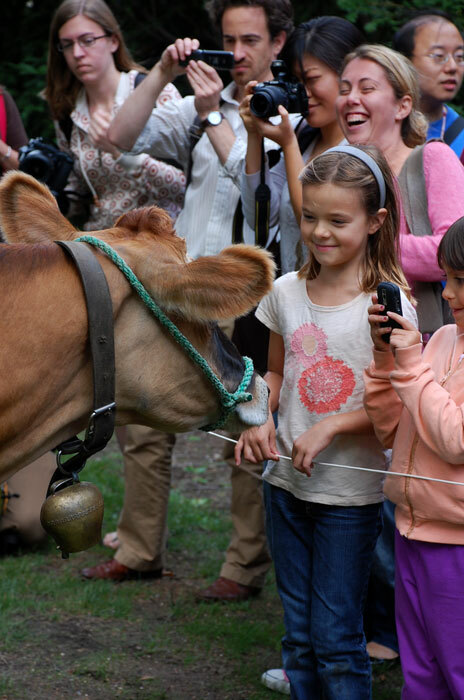 Perhaps it shouldn’t be all that odd to see a cow in Harvard Yard, he told the crowd, as human beings learn how much closer they need to be to nature, and how they must nurture and preserve their surroundings for future generations.